When we refer to wet carpet cleaning, the issue revolves around the process of restoring a flood or water damaged carpet. There are many ways for large amounts of water to find its way into carpets and underlay. We have a very specific approach to salvaging a water damaged carpet. What does the Wet Carpet Cleaning Process entail? When we talk to customers who have experienced wet carpets, we emphasise that they need to take action quickly. 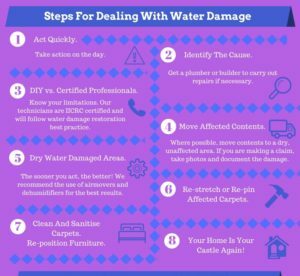 Water in carpets can cause secondary damage to other contents, soft furnishings and wooden furniture. Left unattended, mould incubation may follow which can eventually contaminate other parts of the home. What may seem to be a small problem initially can lead to sick home syndrome over time. Our technicians have a set procedure in dealing with water affected carpets once they arrive onsite. Contents are moved out of affected rooms as a first step (where possible). Water extraction is done where excess water is sucked out of carpets. In cases where carpets are saturated, this action may be repeated. The next step is to dry the carpet, the carpet backing, the underlay and floor. We install air movers and dehumidifiers to complete this task. The drying process takes a few days. Once everything is dry, a further visit is made where carpets are refitted, cleaned & sanitised and furniture is placed back in the rooms. Apart from the rinsing process of extraction, most of our wet carpet cleaning only take place once the carpets are dry. 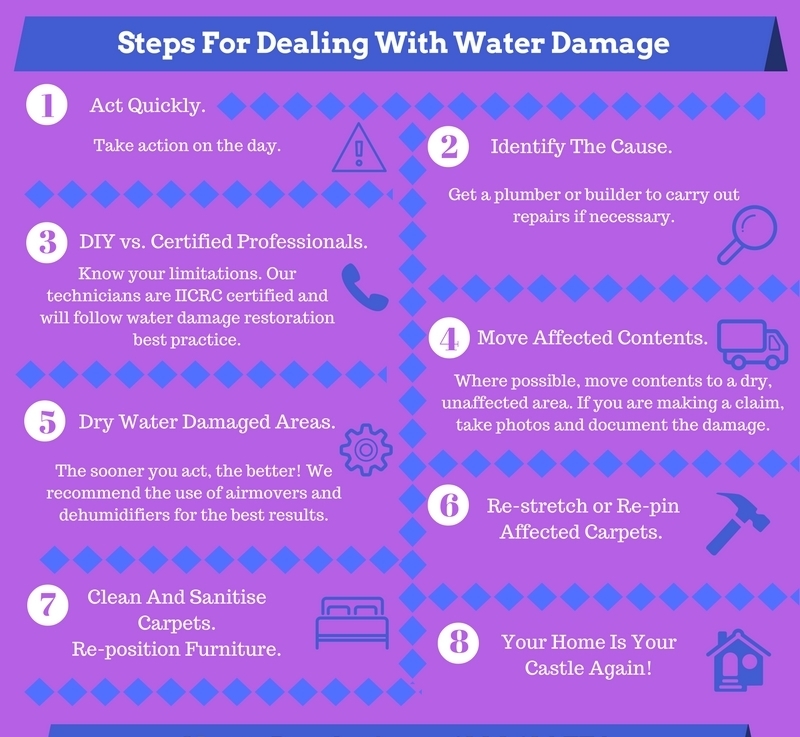 There are no surprises for us when it comes to water damage. Our technicians have taken care of domestic and commercial wet carpets all over Sydney and even in places like Newcastle, Canberra and Melbourne. We are ready for your call. We are never too far away for the next wet carpet emergency.